Today is National Spoil Your Dog Day! So make sure to give your best friend(s) a couple of extra treats and belly rubs today! And celebrate your love for Fido with our hilarious dog themed gifts! Grass is Greener Under My Wiener T-Shirt Ask not for whom the dog barks. It barks for thee. We also have many other hilarious t-shirts, magnets and coasters. Prime Shopping Time @ Installerstore! 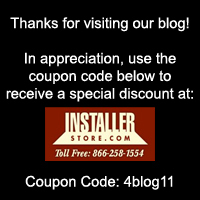 Shop Installerstore.com, FloorRegisters-n-Vents.com, Colored-Caulk.com or Covebase-n-Transitions.com today, and use the coupon code INSPRIME to save 7% on ALL Items! Don’t just save on select items, that tend to quickly switch to “out of stock”. Save on ALL items you would like to purchase! But hurry, coupon code is only valid today (Tuesday 7/12). 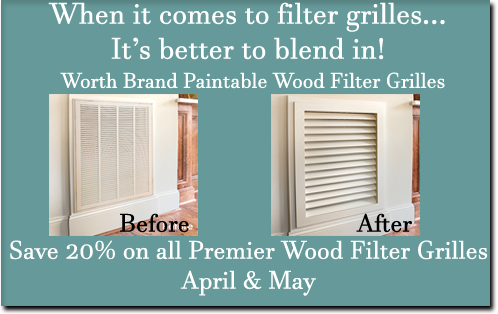 During the months of April and May, INSTANTLY save 20% on all standard sizes of the Worth Premier Filter Grilles! NO coupon code needed! Discount automatically applied when the item is added to your cart. This special promotion pricing is for the Premier Line of Worth Filter grilles and does not apply to the Architectural Filter Grille Line. No other coupon code or promotion can be used with the sale price of this item. 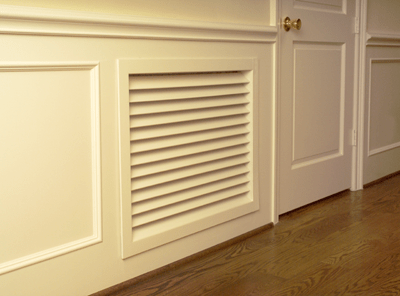 This paintable wood return filter grille is simple to install in your home by yourself. Removing the wood faceplate does not have to be a pain like with the steel filter grilles. You take great pride in your home, and that shouldn’t stop at your filter grilles! Details do matter, so purchase the Worth Premier Filter Grilles and paint to match your decor! Check out our NEW Shoemaker brown baseboard return grilles just added to Installerstore.com and FloorRegisters-n-Vents.com. When ordering your metal vent cover, you must take the measurement of your wall hole opening. A hole size of 14″ x 6″ would need a 14″ x 6″ return grille. Want to match all of your baseboard vents with this attractive brown finish? Replace your existing baseboard vents with these attractive brown baseboard vents today! We are currently working on our toll free (866.258.1554) phone number and it is currently unavailable. If you are having difficulties with our toll free number, please use our local telephone number 608.244.1226. Thank you! It is a brand new year! Do you have cleaning themed New Years Resolutions? If so, click on over to Installerstore.com and check out our full line of cleaning products for ALL surfaces of your home! Here’s to the BEST and cleanest year yet!